Liberal arts colleges pride themselves on providing a quality education that can be completed successfully within four years. Unlike flagship state universities and other public institutions, where five and even six year paths to undergraduate degree completion are increasingly the norm, St. Olaf College excels at having its students graduate in four years. The Annapolis Group represents the nation’s leading liberal arts colleges. Its 130-plus member schools promote and adhere to the values of liberal arts education and include such distinguished institutions as Bowdoin, Pomona, Swarthmore, Amherst, Williams, Oberlin, and Davidson colleges. 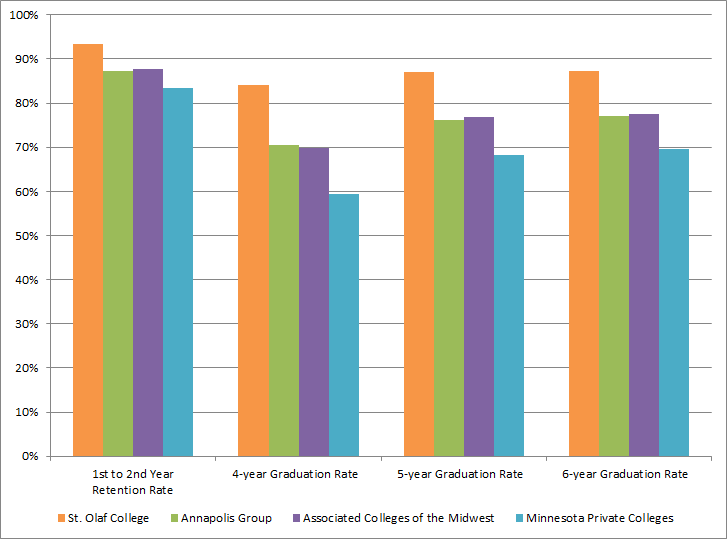 The Associated Colleges of the Midwest (ACM) is a consortium of academically excellent, independent liberal arts colleges located in Illinois, Iowa, Minnesota, Wisconsin, and Colorado. The 14 institutional members include such colleges as Carleton College, Macalester College, Grinnell College, Colorado College, and Lawrence University, among others. The Minnesota Private College Council and its affiliate, the Minnesota Private College Fund, represent private nonprofit higher education in Minnesota. MPCC’s 17 member institutions include St. Olaf, Carleton, and Macalester, along with Gustavus Adolphus College, Augsburg College, University of St. Thomas, and Saint John’s University, and other private colleges and universities. Longitudinal data for St. Olaf from 1991 and breakdown of rates by gender, race/ethnicity, and federal student aid category can be found here. The above graph shows a three-year average of each rate, from the most recent data available through the National Center for Education Statistics (NCES).